Which Are the Best Oils for Healthy Cooking? Finding a healthy cooking oil is not necessarily easy. Your local supermarket’s shelves are likely stocked to the ceiling with different choices in oil, but unfortunately the majority of them are not particularly healthy. Most are vegetable oils that have been processed in a way that damages their fats through oxidation, either mechanically or chemically, which makes them slightly rancid even before you start cooking with them. Following are some healthier choices for oils and fats to cook with. For frying, choose a fat with a high smoke point (the temperature at which a fat begins to show smoke, indicating oxidation) so that heating it to high temperatures does not cause it to oxidize. Ideally, a traditional cooking fat such as duck fat or lard should be used, however, if you are vegetarian or just prefer to use a vegetable oil, the best choice in cooking oils is olive oil or coconut oil. With the warnings about the dangers of trans-fats, lard has begun to acquire a fashionable reputation once more among cooking enthusiasts. This fat that we get from pork has had a less than stellar reputation for a number of years, when saturated fat was out of favor. But in fact, it is by far one of the healthiest fats you can cook with. Lard is made up of approximately 48% monounsaturated fat (which includes small amounts of palmitoleic acid, an antimicrobial), 40% saturated fat (less than butter) and 12% polyunsaturated fat. 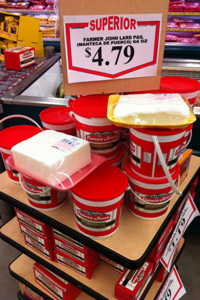 Lard is stable at high temperatures and a preferred fat for baking due to its ability to create a light, flaky pastry. Furthermore, lard’s fats have a neutral or positive effect on blood cholesterol, with a higher smoking point than most other fats. Duck fat consists of about 50% monounsaturated fat (including healthy linoleic acid), 36% saturated fat and 14% polyunsaturated fat. Although its composition is closer to olive oil than butter, when heated it proves more stable than olive oil. The French have cooked their fries and other dishes for centuries with duck and goose fat and they have far lower rates of heart disease. The rate of heart attacks in American men is 315 out of 100,000; in France as a whole that rate is only 145 per 100,000; but in Gascony the region of France where goose fat and duck fat are used in greatest abundance, this rate drops to just 80 per 100,000 men. Of all the vegetable oils, coconut oil is one of the healthiest to cook with. Although it has a high saturated fat content (92%), it contains large amounts of the healthy fatty acid, lauric acid, which has significant antimicrobial and antifungal properties. Organic coconut oil has a high smoking point, does not easily become rancid, and has demonstrated an ability to lower “bad” LDL cholesterol levels. There is a slight coconut taste, however, so some people prefer to use other oils for cooking. 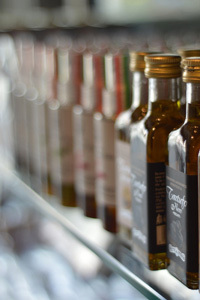 Olive oil’s good reputation is well deserved, as it is the basis for the popular Mediterranean diet, which helps to reduce cardiovascular disease and is high in free-radical fighting antioxidants. Although extra-virgin olive oil is excellent when used in salads, dressings, or to drizzle over crusty bread, it should not be used for cooking, as it is more delicate in structure than plain olive oil and is more easily damaged by heating. For cooking, use straight olive oil. Not only will it end up saving you money (plain olive oil is considerably less expensive than the extra-virgin variety) it is not as easily damaged by heat. Whichever of these healthy cooking oils you decide to use, try to buy the kind that states it is cold pressed or unrefined so as to ensure it has not become oxidized during the refining process. Be sure to keep it in a cool place either in a dark bottle or hidden from light. If you have space in your refrigerator, that’s the ideal place to keep it. It may become cloudy in the cold, but it does not interfere at all with the flavor.